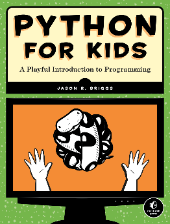 Python for Kids is a lighthearted introduction to the Python language and to programming in general, complete with illustrations and kid-friendly examples. We begin with the basics of how to install Python and write simple commands. In bite-sized chapters, you'll discover the essentials of Python, including how to use Python's extensive standard library, the difference between strings and lists, and using for-loops and while-loops. By the end of the book, readers have built a couple of games and created drawings with Python's graphics library, Tkinter. Each chapter closes with fun and relevant exercises that challenge the reader to put their newly acquired knowledge to the test. Published, December 2012, by No Starch Press. Looking for solutions to the Programming Puzzles in the book? Download the PDF. Having trouble with some of the example code, or don't want to type it all in? Download the code snippets here. The errata for the book can be found here. Looking for more help? Check the blog posts about the book. Read the book? Looking for a further challenge? Why not try out the online Programming Puzzles.